One Touch Engineering offers managed IT solutions for small to medium sized businesses that need comprehensive IT support, but don’t have the time, ability or the desire to fund and manage an internal IT department. We work closely with our clients to create and maintain an IT infrastructure that will support your business’s ability to provide superior customer service. Outsourcing your IT support allows you to establish predictable IT management costs with the flexibility to scale to your needs. To learn more about all the services we offer, click here. Over time, computers can become slow or even inoperable due to viruses or hardware issues. We offer diagnostic and computer repair services that will keep your machine running like new. Setting up a wireless network for your home or business can seem like a daunting task. We can quickly have you set up with a fast, secure and reliable wireless network. One Touch Engineering will set up and manage your server, configuring applications for your specific needs. We will customize settings to match the demands of your operation. Managing Active Directory yourself can be a burdensome chore full of repetitive and mundane tasks that rob you of your productive time. At One Touch Engineering, we are happy to manage this for you. Why Outsource Your IT Management? 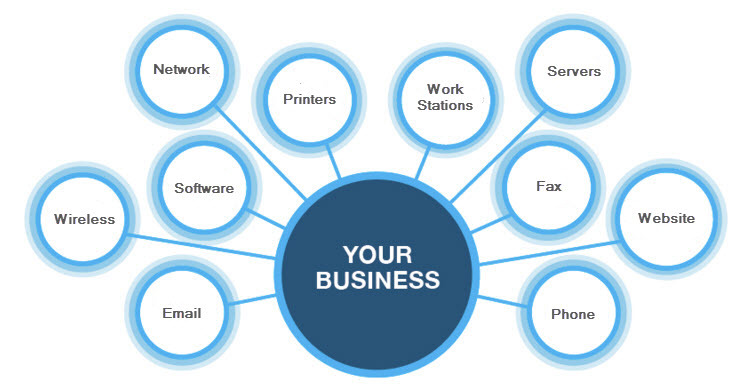 Our staff has decades of experience in providing small business IT solutions. We stay up to date with industry news and trends in order to give you the best service possible. Outsourcing your IT allows you to reduce overhead by only having to pay for the level of service you need vs. having to pay all the costs associated with a dedicated IT staff. By outsourcing your IT management, you have the flexibility to change your level of service based on the needs of your business. IT becomes an easily manageable line item on your P&L. By letting One Touch Engineering manage your IT, you have the freedom to focus on your core services. No more being burdened by tech concerns or trying to solve problems outside of your expertise. One Touch Engineering has been a great move for our company. Zack worked very closely and patiently with us as our company transitioned to new software and new equipment. Most small businesses like ours cannot justify a full-time IT employee. Having Zack Doty and One Touch Engineering on our team gives us the best of both worlds: capable tech support without adding a position. One Touch Engineering has been providing IT services for my business since 2009. I can honestly say since they began working in our business, we have been functioning efficiently and problem-free within our IT infrastructure. Prior to using One Touch Engineering we experienced many frustrations, extra costs and issues. Copyright One Touch Engineering 2017. All Rights Reserved.